My other half loves puddings and pies, especially if they’re made with apple and he’s an especially happy boy if I serve him pudding with custard. This recipe ticks both boxes, a true home style cake, but what it lacks in refinement it makes up for in flavour. 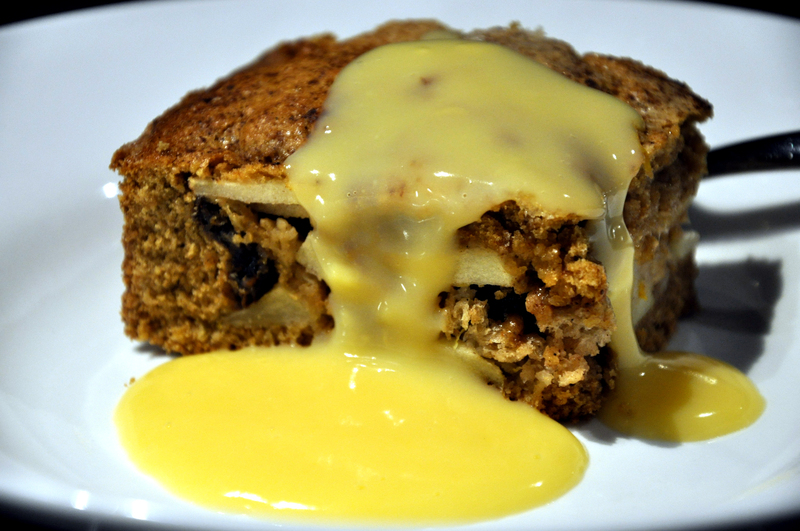 It’s a hearty pudding if served warm with custard, and it’s a delicious moist cake to serve with a cup of tea the next day. Preheat oven to 170C. Grease a 30cm square shallow cake tin and line with baking paper. Peel, core and finely slice the apples into a bowl. Add the lemon zest, cinnamon, raisins and breadcrumb. Mix well. Cream the butter and brown sugar until light and fluffy then beat in the eggs one at a time. Stir in the flour, oats and psyllium husks. Divide the mixture in two, then using well floured figures, press half the dough into the cake tin to line the base and sides. To the remainder of the cake mixture, add enough milk to make the dough spreading consistency. Tip the apples into the cake base, then spread the soft cake batter over the top. Sprinkle with extra ground cinnamon and granulated sugar. Bake for approximately 45 minutes until the cake is golden brown and a the apples offer no resistance if the cake is pierced with a skewer. This entry was posted on July 27, 2012 by ladyredspecs in Baking, Cakes, Desserts, Food, Warm Puddings and tagged apple, cake, cinnamon, PUDDING.